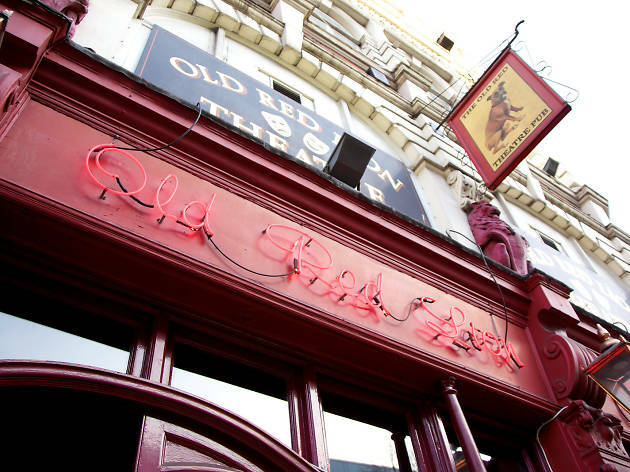 The Old Red Lion is most famous for the matchbox-sized fringe theatre that sits above it, staging no-budget productions of plays both old and (mostly) new. But the pub itself shouldn’t be overlooked: it’s not quite a world away from the boisterous boozers on Upper Street, but it’s certainly a welcome relief. Although it could use a spruce-up, it’s a handsome place at heart, part-partitioned by an etched-glass screen and otherwise furnished with old-fashioned pub booths, tables and stools. Your company at the bar will be a mix of quiet pint-nursing regulars (the beer is very decent, with Harveys Sussex Best among the five ales), pre- and post-theatre drinkers, the occasional student (City University is down the road) and refugees from the alcoholic turbulence closer to the Angel. Small cosy theatre, upstairs in the Old Red Lion pub, in Islington. Fringe productions from talented groups. Good to visit for a beer downstairs and then watch a play. The Old Red Lion is a great little pub for a chilled drink (in both senses) in the evening. I personally think it's quirkier than most of the nearby Upper St. pubs and has a good outdoor area when it's warmer. It's unique element however, is it's small upstairs theatre, which is home to the most random productions (judging by the posters) but looks good fun. They also serve Pieminster pies, which is a refreshing alternative to the wide gastropub offering in the other locals. All in all, if you're looking for an evening experience with a difference in Angel – The Red Lion is your pub. This looks like a normal pub on the Upper Street but it is actually a great little place. You can listen to live music every night and the entrance is free. You also have theatre in the upstairs section. The only drawback is that it can get really crowded downstairs. Just found this place, this year. Great drinks and a massively varied programme of theatre... Can see why it is an Offies winner! Creative theater, really well performed in an intimate setting. A great, informal way to integrate theater into culture in greater depth. I have seen very funny, very poignant and quite challenging pieces. A gem. So The Old Red Lion - or as I was down by the skatepark I heard a few cool kids call it ORL. But I'm guessing that's because they were a bit ashamed to say the full name. It ain't great there. You'll get a good pint, but the bar is small, so the getting of said good pint may take some time. Something that must be brought to the attention of any perspective customers was the service of a Guinness in a Carling glass. Sure it was busy because of the football. but some sins are unforgivable! However, whilst on the subject of football the ORL is a good place to watch a game, or any sport. The massive projector they roll out makes having a bad view near impossible. So regularly it pulls a big crowd at the weekend, and usually a fun one. The amount of atmosphere a projector can generate is ridiculous! A word of warning though: PLEASE stay downstairs. 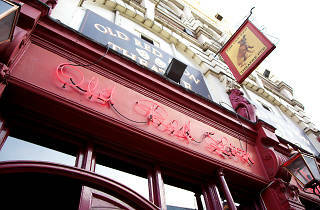 To clarify The Old Red Lion is a theatre pub, and from past experience not a discerning one. Rather the perfect place for anyone with black clothes, an iPod dock and a political stance to come and rattle on about "Tory c*nts," and the dejected lower classes. And sure the low classes are dejected and the Tories are certainly c*unts, but come on now. Let's leave the biting dialogue and activism to the professionals. Did no one learn from Russell Brands no vote melt down!? If you're on a crawl then definitely stop in, by for a session or thinking of catching a show maybe keep clear.